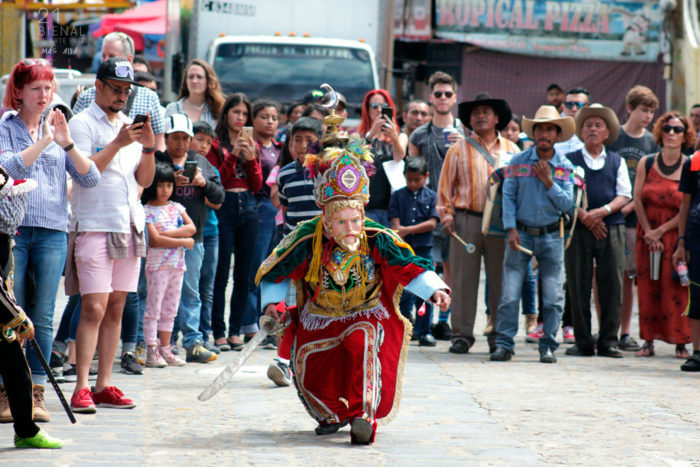 Representación de la danza de los moros y cristianos frente a la municipalidad, con la que inició la participación de Sumpango, Sacatepéquez en las actividades de la 21 Bienal de Arte Paiz. Imagen cortesía de Fundación Paiz. 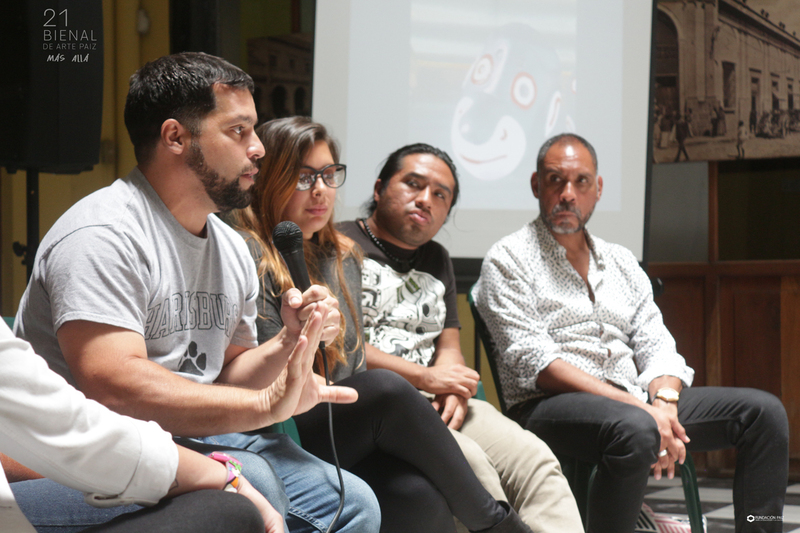 To hold a biennial of visual arts in one of the most unequal, corrupt, and illiterate countries of the Americas is not an easy task. And if the Paiz Foundation deserves some credit, it consists of bringing together for more than forty years’ gallery owners, artists, and curators from Central America along with their counterparts from other parts of the world in a dialogue which facilitates the recognition of local artists, as well as learning about the workings and different forms of interaction in the international art market. The isolation which prevailed throughout Guatemala and, in general, the entirety of Central America due to the Cold War, with its tragic downfall of dictatorships, armed insurrections, and thousands of innocent victims, still looms over the economy, the education system, but above all, in the idiosyncrasies of its people. Postmodernity invaded our lives, perpetuating colonialism in which we our trapped. In this way, for new generations, the Internet arrived before primary school, transnational franchises before agricultural technology, and bank mergers before a relevant legislation. 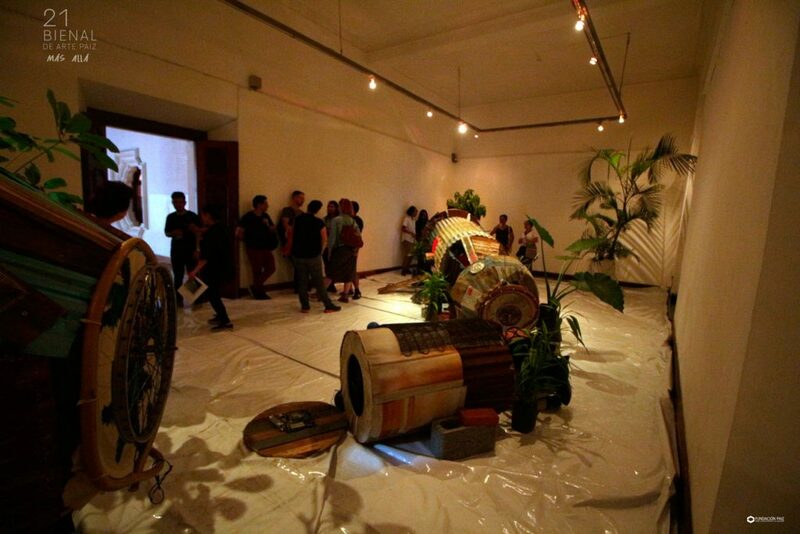 In these circumstances, to run any art-related event involves confronting these contradictions, opening spaces for discussion, education, and exchange, more than just expositions. It involves accepting beforehand that it will not be able to fulfil all the expectations, that the original proposals will change along the way, and given the extent of our scarcities, there will always be financial difficulties. 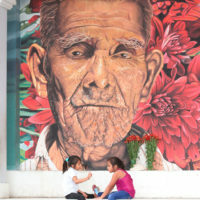 Restauración de una serie de murales en el Parque Central de San Juan Comalapa, municipio de Chimaltenango; en el marco de su participación en la 21 Bienal de Arte Paiz “Más Allá”. Imagen cortesía de Fundación Paiz. 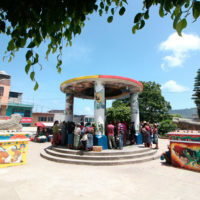 This has been understood by the organisers of the Paiz biennial, which went from being a small contest, aimed at encouraging the national Guatemalan awareness in the 1980s, to an exhibition that encompasses both galleries and public spaces retaining a regional character along with a curatorial script. Of course this process has not taken place without disputes: the reduction in the number of exhibitors during the 1990s left out many up-and-coming artists who resented the lack of support; and the incorporation of contemporary art techniques at the beginning of this century received negative criticism, both from the general public and artists accustomed to traditional techniques. By 2010, the biennial was already starting to show signs of exhaustion. Works of the invited artists were not understood by the public, and pieces created by local artists had been reduced to a small group of award-winning individuals from previous events. 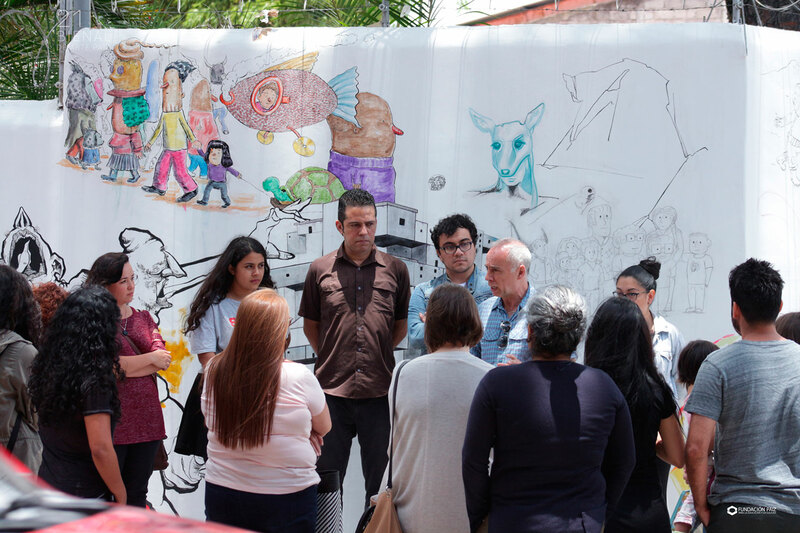 Ultimately, we all understood that the situation was due to causes that exceeded the capacities of any institution dedicated to the dissemination of art: The Escuela Nacional de Artes Plásticas is situated, for the past sixteen years and still to the present day. In complete abandonment, public education was prioritizing technical careers, disregarding the humanities, and the first effects of the Free Trade Agreement with EUA had damaged local producers and exporters. 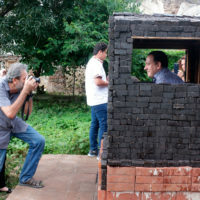 Santiago Olmo, the main curator of the biennial during the year 2012, conscious of the outlook that it was presenting, focused more on the social process of each artist whilst producing their work rather than the final result of exposing, further aggravating the nuisances and questioning: Had traditional art lot its value? What could be the ethical stance of an artist that undertakes social work, if at the end he sells the documentation of the process as his own work? What form should art adopt for our region? Although the questions formed since 2012 cannot have unanimous solutions, and far from being resolved, the institutional crisis and politics has increased throughout the region, discussions have helped us to discover the multiple interstices of aesthetics. 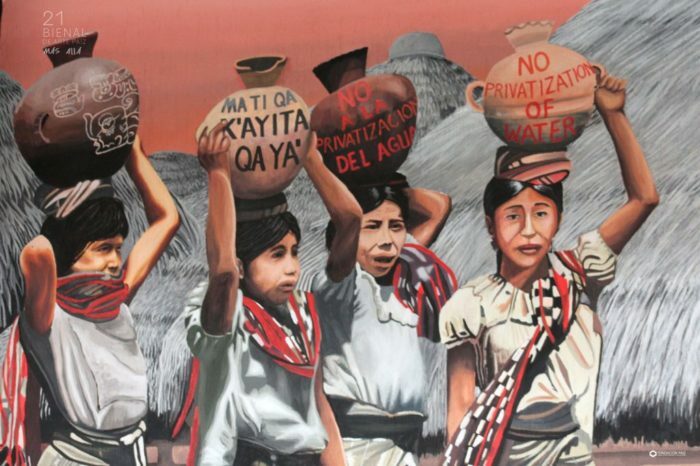 Political activism has been incorporated into the gallery—just as it occurred in the European post war period of the 1960s—, spaces have opened for a dialogue with indigenous art, perhaps still not a sufficient amount, not from a folkloric perspective, and it has attempted to outline a concept of Latin American postmodernity, from the borders of the global village. 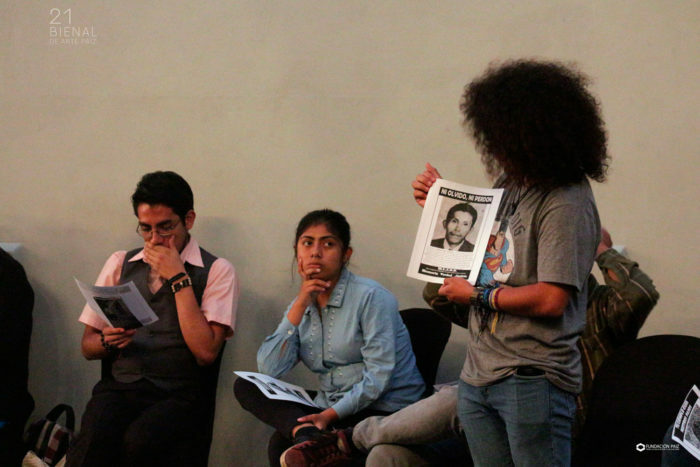 Examples of this can be seen with the Bandera Negra (Black Flag), installed by Regina Galindo in the Plaza of the Guatemalan Constitution during the 2015 demonstrations after being installed in Mexico City at Museo Ex-Teresa; the “invisible performances” made by Benvenuto Chavajay on the original peoples daily life within the city, or the transformation of Kakchiquelclothing and recovery of the language under the same name evidenced by the work of Marylin Boror. 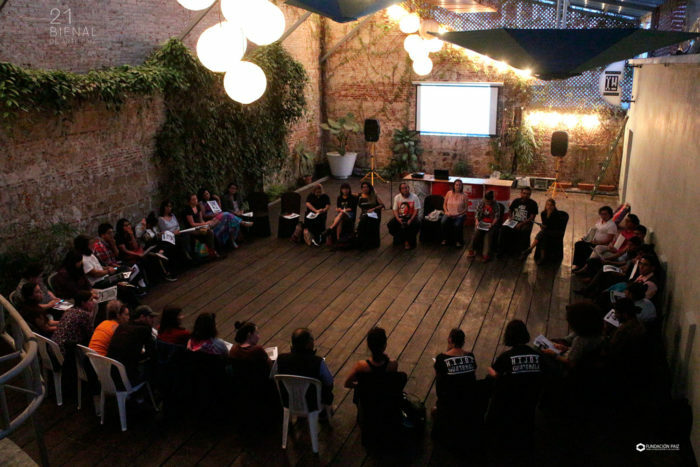 Concepts such as “decoloniality”, “neoteric culture” or the evocation of the name “Abya Yala” for the entire Caribbean and Mesoamerican region, are on test through discussions promoted not only in centralized institutions of the capital, but also within artistic groups and cultural centers in the interior. 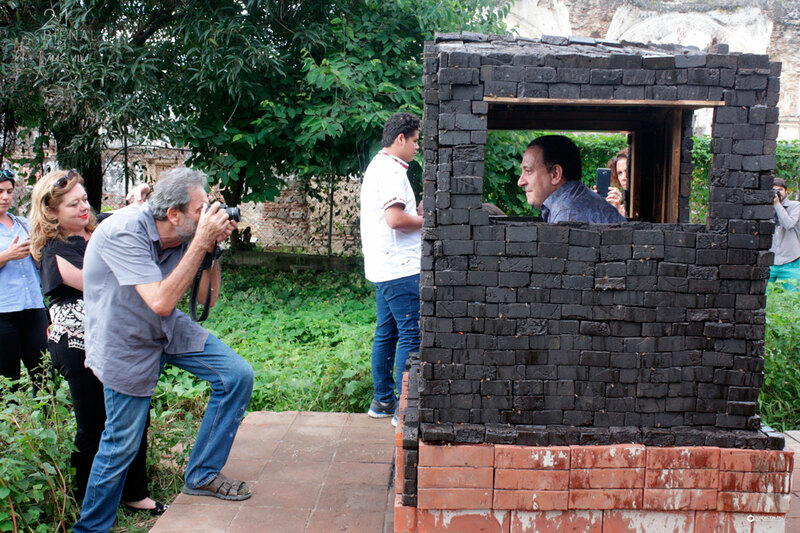 El 18 de agosto se realizó una visita guiada a “Dulce Hogar”, obra de la artista Inés Verdugo, en Concepción 41, Antigua Guatemala, Sacatepéquez, construida en forma de una pequeña casa a partir de bloques de panela. Imagen cortesía de Fundación Paiz. 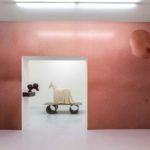 Of course, the scene couldn’t be more unfavourable for us, and the general perception is that during the current Biennial fewer works have been exhibited than in previous years. This is due, to a large extent, to the fact that many of the exhibitions used platforms that already existed in social activism, without the final proposal going beyond the conventional forms. 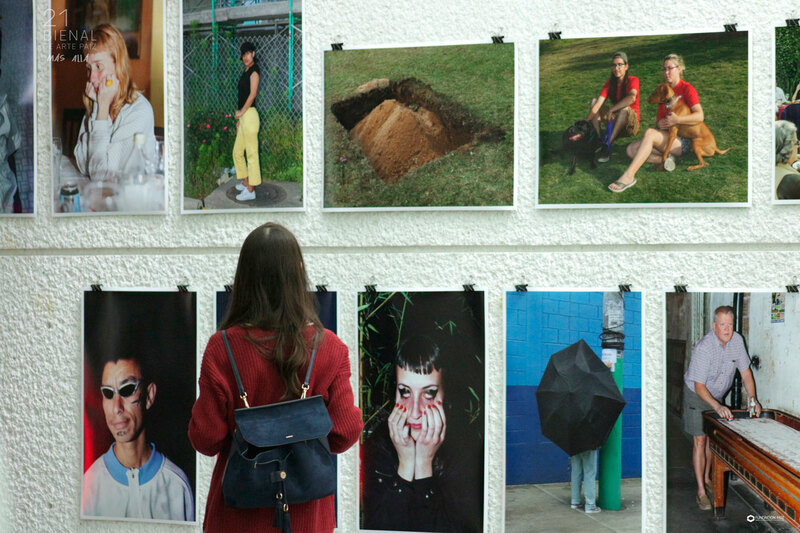 Once again we have seen the photographs of the 3,000 registered people as disappeared during the internal armed conflict, whilst just two months before, in San Juan Comalapa (a town that also became part of the run of exhibitions “inwards” of the biennial this year), returned to bury 98 unidentified bodies, and the population found out that the number of clandestine graves was at least three times more than the amount investigated to date. 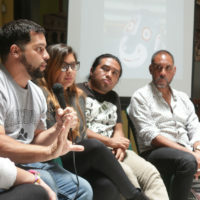 Addressing the economic and social inequalities, even with the good intentions and engagement of artists such as Jesús Negrón, Magdalena Atria and Ricardo Lanzarini, didn’t ditch the common cliché of running drawing, painting and art workshops in marginalised areas of the Guatemalan capital, whose images of neglect and poverty have already been amply exploited by NGOs, newspapers, and film producers. The violence of gender, a topic that in previous years has been approached from a more psychological perspective, had on this occasion fewer participants, even though the fatal cases have increased at an alarming rate. Perhaps the box of denunciations installed by Tania Bruguera inside the University of San Carlos, or the photographs of Lyndsie Price about the western normativity of the feminine body help to demonstrate less visible forms of this violence, although, the rise of its most brutal forms requires a different approach. 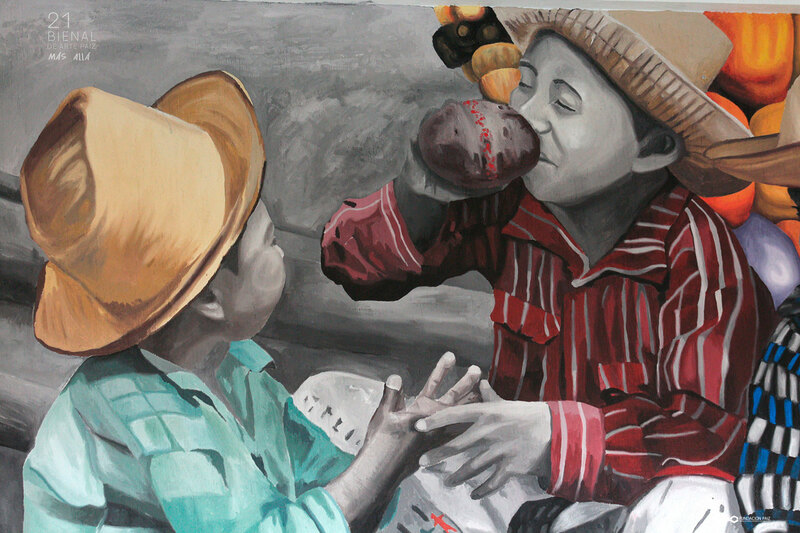 Since the 1990s, original people artists have had a bigger presence in the Guatemalan art scene, rebelling against the folklorizing visions, and exhibiting works increasingly further removed from the ‘primitivist’ art, not conforming themselves with filling a space in biennials and international expositions, but rather returning to their communities in order to develop educational projects and contribute in this manner to their development. 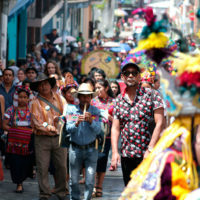 In line with this feeling, Gerardo Mosquera, the general curator of this year’s biennial, decided to broaden the spectrum of the exhibitions, including organisations and community projects from other regions: Rabinal, Xelajú, San Juan Comalapa, Livingston, Sumpango and San Pedro la Laguna. To go ‘beyond’ the quasi-religious concept of art—in order to get closer to the people in an exchange capable of generating social awareness. The artists who were invited held discussions and workshops with the residents of the communities and left an artwork created as a group; sometimes, of a permanent nature, whilst others, more ephemeral. 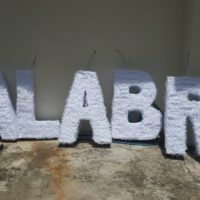 The response was not entirely favourable, given that, independently from the biennial, each community has run their projects for years, and it didn’t seem to everyone that the external intervention was useful on both sides. Can one really call these type of actions decolonializing? Will we not be ultimately assisting a new form of colonization? Whatever happens, the astonishment is mutual, just as the invited artist can be surprised when confronted with a reality that is foreign to them. Also, the locals perceive the recent arrival as an “exotic agent”. The difference between cultural tourism and cohabitation basically depends on the openness of every part involved. The expositions that took place in Mexico and Panama cannot be accessed, but in my opinion, the one which gained the most acceptance was the montage in the old post office building in Guatemala City. This exhibition in particular acquired meaning in Guatemalan eyes due to our recent history: Alfredo Ceibal’s drawings illustrated natural disasters and their various causes; the bills and bottles intervened by Cildo Meireles evoked the union struggle against the Coca Cola bottling plant, as well as the issuance of counterfeit money during the 1980s. 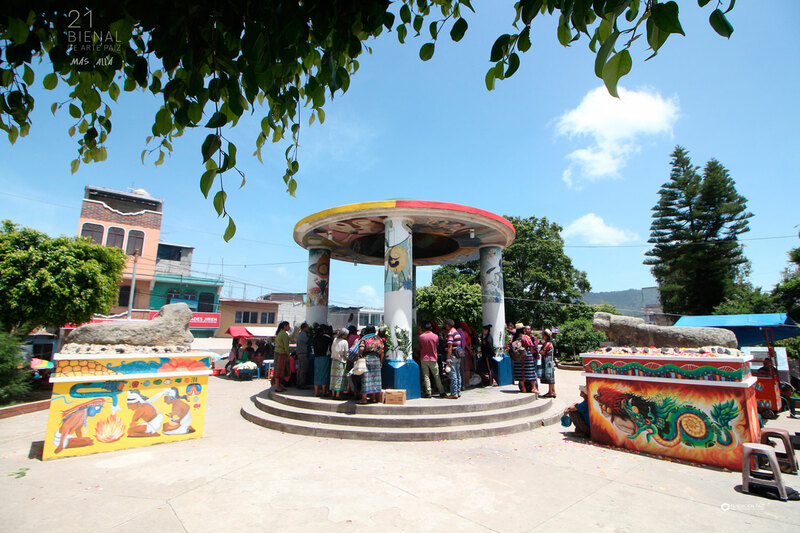 In the “border crossing” of the Chinese artist Zu Xhen we could see a reflection of our territorial disagreement with Belize; the “champas” shaped like a space capsule by Simón Vega presented us with a tragicomic alternative to the problem of urban immigration. The glitch art of Bryan Castro, inviting the public to scratch on works and photos of the artists in electronic pages of the Biennial. 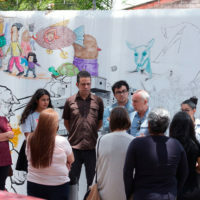 Or the interactive installation of Ricardo Lanzarini, objected to by gallery owners due to his “in situ” cartoons of Guatemalan President Jimmy Morales, all of which helped to desacralize the gallery, without appealing to the academic bombast of previous years. 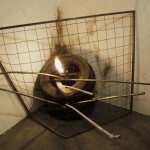 Leonel Alfonso Juracán is a clinic lab technician, artist and philosopher based in Guatemala. 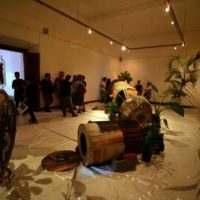 Hacer una bienal de artes visuales en uno de los países más desiguales, violentos y analfabetas de América no es tarea fácil. 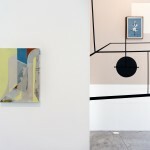 Y si algún mérito le corresponde a la Fundación Paiz, éste consiste en reunir desde hace más de cuarenta años a galeristas, artistas y curadores de Centroamérica junto a sus homólogos de otras latitudes, en un diálogo que permite el reconocimiento mutuo entre los artistas locales, así como aprender sobre mecánicas y formas diferentes de interacción en el mercado internacional de arte. El aislamiento en el que se mantuvo Guatemala, y en general, toda Centroamérica debido a la Guerra Fría, con sus cauda trágica de dictaduras, insurrecciones armadas y miles de víctimas inocentes, aún pesa sobre la economía, la educación, pero sobre todo, en la idiosincrasia de sus pobladores. La postmodernidad irrumpió en nuestras vidas dándole continuidad al colonialismo. De manera que, para las nuevas generaciones, llegó antes el internet que la escuela primaria, las franquicias transnacionales antes que la tecnología agrícola, y las fusiones bancarias antes que una legislación pertinente. En estas condiciones, realizar cualquier evento relacionado con arte, implica enfrentarse a éstas contradicciones, abrir espacios de discusión, educación e intercambio, más que de exposición. 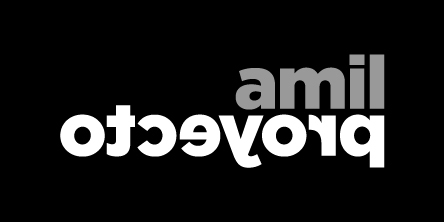 Aceptando de antemano que no se podrá cumplir con todas las expectativas, que los planteamientos originales deberán transformarse en el camino, y dada la magnitud de nuestras carencias, siempre habrá problemas de financiamiento. Esto ha sido comprendido por los organizadores de la Bienal Paiz, que pasó de ser un concurso de salón, encaminado a fomentar la conciencia nacional guatemalteca en los años ochenta, a una muestra que abarca tanto galerías como espacios públicos, de carácter regional y con guion curatorial. Por supuesto que éste proceso no ha ocurrido sin desaveniencias: la reducción en el número de expositores durante los años noventa dejó fuera a muchos artistas emergentes, que resintieron la falta de apoyo; y la incorporación de obras en formatos contemporáneos al principio de éste siglo obtuvo críticas desfavorables, tanto dentro del público como de los artistas habituados a las técnicas tradicionales. 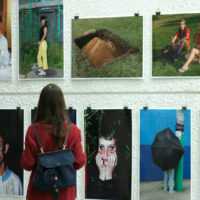 Para el año 2010, la bienal empezaba a presentar ya síntomas de agotamiento, pues las obras de los artistas invitados no eran comprendidas por el público, y las realizadas por artistas locales se habían reducido a un pequeño grupo de galardonados en eventos anteriores. En el fondo, todos comprendíamos que la situación obedecía a causas que excedían las capacidades de cualquier institución dedicada a la difusión artística: la Escuela Nacional de Artes Plásticas se halla en completo abandono desde hace diez y seis años, hasta la actualidad; la educación pública prioriza el aprendizaje de carreras técnicas, en desprecio de las humanísticas, y los primeros efectos del Tratado de Libre Comercio con Estados Unidos han perjudicado a los productores locales y exportadores. 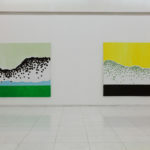 Consciente del panorama que se presentaba, el curador general de la bienal durante el año 2012, Santiago Olmo, se enfocó más en el proceso social de cada artista al producir su obra, que en el resultado final a exponerse, agudizando aún más las molestias y cuestionamientos: ¿Había perdido valor el arte “de caballete”? ¿Cuál podía ser la postura ética de un artista que realiza una labor social, si finalmente vende la documentación del proceso como obra Suya? 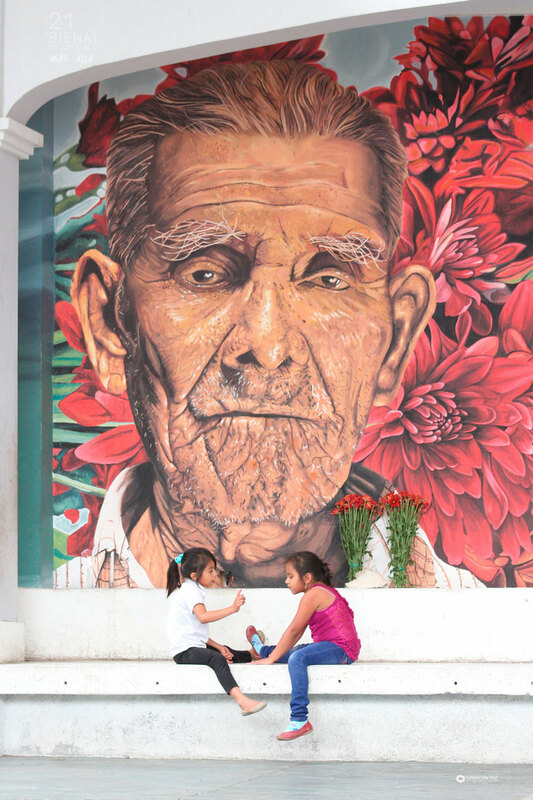 ¿Qué forma debía adoptar el arte para nuestra región? Aunque las preguntas formuladas a partir del 2012 no pueden tener soluciones unívocas, y lejos de resolverse, la crisis institucional y política se ha incrementado en toda la región. La discusión nos ha servido para descubrir los múltiples intersticios del quehacer estético. 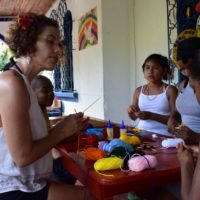 Se ha incorporado el activismo político a la galería, tal como ocurrió con la posguerra europea de los años sesenta, se han abierto espacios, quizá no los suficientes todavía, para el diálogo con el arte indígena, desde una perspectiva no folklorizante, y se ha intentado plantear un concepto de postmodernidad latinoamericana, desde los márgenes de la aldea global. Ejemplos de esto los podemos observar con la Bandera negra instalada por Regina Galindo en la Plaza de la Constitución guatemalteca durante las manifestaciones del 2015, tras haber sido instalada previamente en el Museo Ex-Teresa de la Ciudad de México; los “performances invisibles” realizados por Benvenuto Chavajay sobre la cotidianidad de pueblos originarios dentro de la ciudad, o la transformación de la indumentaria Kakchiquely recuperación del idioma bajo el mismo nombre evidenciada por la obra de Marylin Boror. 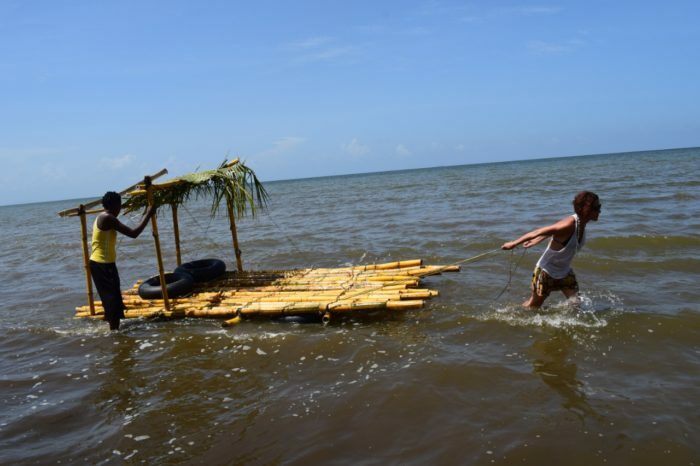 Conceptos tales como “decolonialidad”, “cultura neotérica” o la evocación del nombre “Abya Yala” para toda la región caribeña y mesoamericana, se ponen a prueba mediante discusiones promovidas no sólo en instituciones centralizadas de la capital, sino también al interior de agrupaciones artísticas y casas de la cultura en el interior. Por supuesto, la escena no podía sernos más adversa, y la percepción general es que durante la presente Bienal se han presentado menos obras que en años anteriores. Esto se debe, en buena medida, a que bastantes de las exposiciones utilizaron plataformas ya existentes en el activismo social, sin que la propuesta final trascendiera las formas acostumbradas. Nuevamente hemos visto las fotografías de las tres mil personas registradas como desaparecidas durante el conflicto armado interno, mientras que apenas dos meses antes, en San Juan Comalapa (pueblo que además se convirtió en parte del circuito de exposiciones “hacia el interior”), se volvieron a enterrar 98 cadáveres no identificados, y la población se enteraba de que el número de fosas clandestinas era al menos el triple de las investigadas hasta la fecha. El tratamiento de las desigualdades económicas y sociales, aún con la buena intención y compromiso de artistas como Jesús Negrón, Magdalena Atria y Ricardo Lanzarini, no abandonó el ya común tópico de realizar talleres de dibujo, pintura y arte lúdico en áreas marginales de la capital guatemalteca, cuyas imágenes de abandono y miseria ya han sido ampliamente explotadas por organizaciones no gubernamentales, periódicos y productores de cine. La violencia de género, tema que en años anteriores ha sido abordado desde una perspectiva más psicológica, tuvo en ésta ocasión menos participantes. Pese a que los casos mortales han incrementado de forma alarmante. 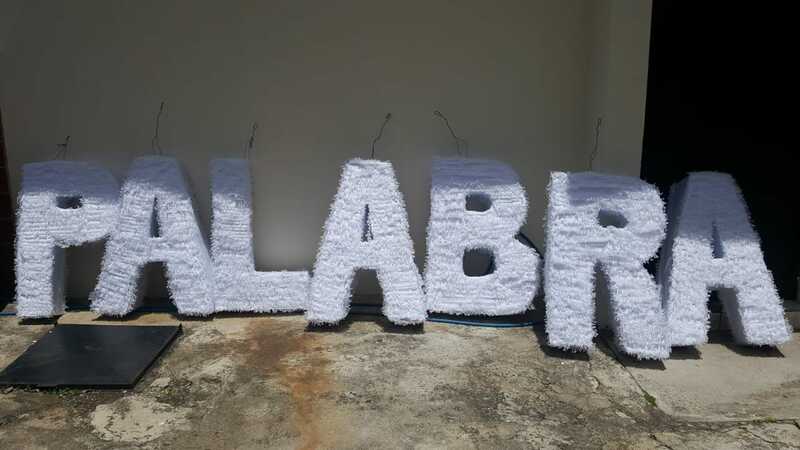 Quizá la caja de denuncias instalada por Tania Bruguera dentro de la Universidad de San Carlos, o las fotografías de Lyndsie Price sobre la normatividad occidental del cuerpo femenino ayuden a evidenciar formas menos visibles de ésta violencia, sin embargo, el aumento de sus formas más brutales necesita otras formas de abordaje. 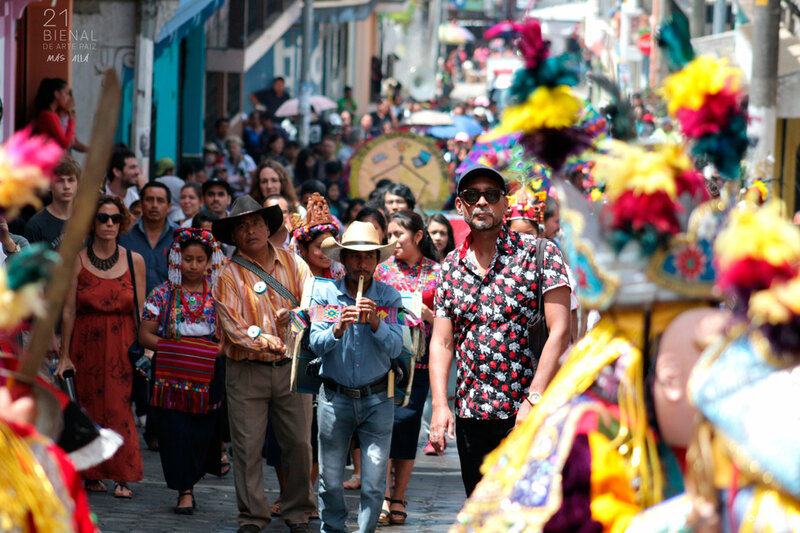 Desde los años noventa, los artistas indígenas han tenido mayor presencia en el escenario artístico guatemalteco, rebelándose contra las visiones folklorizantes, y mostrando obras cada vez más alejadas del arte “naif”, no conformándose con ocupar un sitio en bienales y exposiciones internacionales, sino volviendo también a sus comunidades de origen para desarrollar proyectos educativos y contribuir de éste modo a su desarrollo. 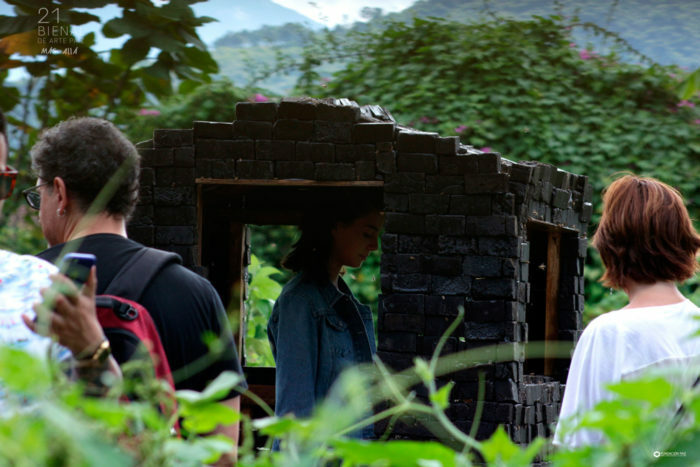 En sintonía con éste sentir, Gerardo Mosquera, curador general de ésta bienal, decidió ampliar el espectro de las exposiciones, incluyendo asociaciones y proyectos comunitarios de la provincia: Rabinal, Xelajú, San Juan Comalapa, Livingston, Sumpango y San Pedro la Laguna. Ir “Más allá” de la concepción cuasi religiosa del arte, para acercarse a la gente en un intercambio capaz de generar conciencia social. 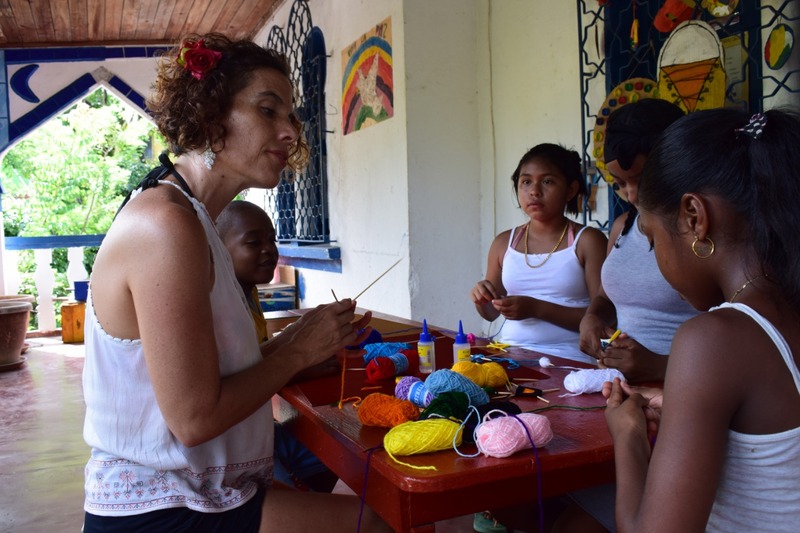 Los artistas invitados, sostuvieron charlas y talleres con los habitantes de las comunidades y dejaron una obra construida en conjunto; algunas veces, de carácter permanente, y otras, más efímero. La respuesta no fue del todo favorable, puesto que, independientemente de la bienal, cada comunidad ha gestionado sus proyectos desde hace años, y no a todos les pareció que la intervención externa fuese de provecho para ambas partes. ¿Realmente se puede llamar a éste tipo de acciones decoloniales? ¿No estaremos, en el fondo asistiendo a una nueva forma de colonización? En todo caso, el extrañamiento es mutuo, y así como el artista invitado puede sorprenderse ante una realidad que le es ajena, también el habitante local percibe al recién llegado como un “agente exótico”. La diferencia entre el turismo cultural y la convivencia, depende básicamente de la apertura de cada una de las partes involucradas. No pude acceder a las exposiciones que ocurrieron en México y Panamá, pero a mi parecer, la que obtuvo el mayor grado de aceptación fue el montaje efectuado en el antiguo edificio de Correos en la Ciudad de Guatemala. Esta exposición en particular, adquirió significado ante los ojos guatemaltecos debido a nuestra historia reciente: los dibujos de Alfredo Ceibal ilustraban los desastres naturales y sus diversas causas; los billetes y botellas intervenidas por Cildo Meireles evocaron la lucha sindical contra la embotelladora Coca Cola, así como la emisión de billetes falsos durante los años ochenta; en el “cruce de frontera” del artista chino Zu Xhen podíamos ver un reflejo de nuestro diferendo territorial con Belice; las “champas” con forma de cápsula espacial de Simón Vega nos presentaron una alternativa tragicómica al problema de la inmigración urbana. El glitch art de Bryan Castro, invitando al público a rayar sobre obras y fotos de los artistas en páginas electrónicas de la Bienal. O la instalación interactiva de Ricardo Lanzarini, objetada por los galeristas debido a sus caricaturas ”in situ” del presidente guatemalteco Jimmy Morales, todo ello contribuyó a desacralizar la galería, sin apelar a la ampulosidad académica de años anteriores. 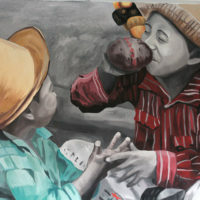 Leonel Alfonso Juracán es laboratorista clínico, artista y filósofo radicado en Guatemala.